SAN FRANCISCO – June 20, 2013 – Chartboost, the leading technology platform for mobile games, today announced an expansion of the company’s Direct Deals offering, the industry’s only option for developers to buy and sell traffic directly with other developers without paying fees. Groups for Direct Deals enable mobile game developers to create their own networks, making it easier to find partners and run campaigns with each other. “Our partners want to connect with other developers based on their relationships – whether driven by location, shared experiences, similar apps, or common interests – and we are providing the technology to connect them. With the addition of Groups, it will be easier than ever for developers to work together to be successful,” said Maria Alegre, CEO of Chartboost. Developers around the globe already use Chartboost to directly connect with each other. In fact, the first Group for Direct Deals created comes from Vancouver, British Columbia. “Vancouver is home to an established and growing community of awesome mobile game developers. We’re excited to have our own Group set up with Chartboost to meet fellow Vancouver game developers, discover opportunities, set up campaigns, negotiate direct deals and discuss new and upcoming apps,” said Josh Nilson, COO, East Side Games. Today, many Direct Deals begin with a developer analyzing the performance of their advertising or publishing campaigns, identifying the top performing apps, and approaching that developer directly in the Direct Deals Marketplace. Direct Deal campaigns are a highly effective method for user acquisition, providing developers with nearly double the install rate of standard network campaigns. The marketplace is also extremely popular among some of the industry’s largest studios – 71 out of the 100 largest mobile game developers in the Chartboost network completed a Direct Deal in 2013. Chartboost, which raised a $19 million series B round led by Sequoia Capital in January, opened its first European office in Amsterdam in April. The company currently employs more than 60 people between San Francisco and Amsterdam, and recently graduated its first University Bootcamp class. For more information please visit www.chartboost.com and read the Chartboost blog at blog.chartboost.com. 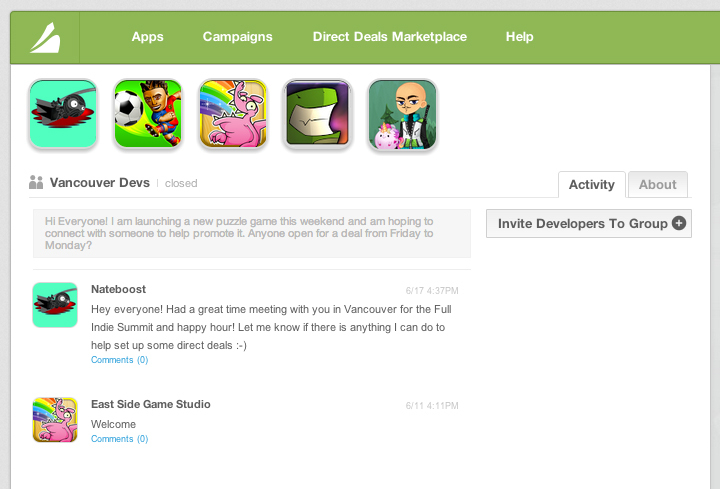 Chartboost is the leading games-only technology platform that helps developers reach more users and make more money. The company powers over 16,000 games and works with companies like Backflip, Capcom, Com2us, Crowdstar, DeNA, Djnworks, Fluik, Gameloft, Gamevil, Get Set Games, GREE, Kabam, Kiloo, King, Natural Motion, Neon Play, Nimblebit, Outfit7,Pik Pok, Pocket Gems, Supercell, TinyCo, Wooga, Z2labs and many more. The Chartboost network reaches over 300 million unique monthly devices and drives over eight billion game sessions per month. Headquartered in San Francisco and with a European office in Amsterdam, Chartboost was founded in 2011 and has raised a total of $21M from Sequoia Capital and other investors. More information at www.chartboost.com.